We lost another influential author last week. Kate Wilhelm was one year older than Ursula Le Guin and also lived in Oregon (though in Eugene, not Portland). I've probably read most of her considerable body of work. Indeed, some of her characters and their situations have lodged deep within my imagination; I'm not sure when I realized that some of these have even crept their way into my own work without my noticing. Because of that, I always find it strange to hear from younger women writing sf that they were unfamiliar with the fiction she wrote before turning mainly to murder mysteries. Her speculative fiction is largely of a non-flashy type, blending a realist style with an intense interest in the psychological and social dimensions of her characters' lives; geographical setting and local politics often figure prominently. Kate was awarded three Nebulas and two Hugos, and SFWA's Solstice Award (which was later renamed the Kate Wilhelm Solstice Award in her honor). 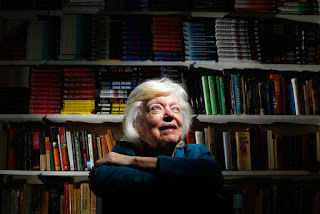 She was inducted into the Science Fiction Hall of Fame in 2003. Perhaps her greatest influence was as a teacher and workshop mentor, beginning with the Milford Science Fiction Writers' Conference in the late 1950s, and then with the Clarion Science Fiction Writers' Workshop. I believe that even after she stopped teaching at Clarion, she continued participating in and hosting workshops. When Leslie What and Nina Kiriki Hoffman took Eileen Gunn, Gwyneth Jones, and me to visit her in Eugene in 2004, Kate took us into a room with comfortable chairs arranged along the perimeter; someone mentioned that this was where Eugene writers often gathered to workshop their stories (and a joke was made about Kate's tough critiques). Later she showed us an enclosed swimming pool that had been filled with soil and made into an indoor garden, something I'd never have imagined but afterwards struck me as fitting my previous image of her perfectly. You can find a good bibliography of her work in the Kate Wilhelm entry at the Encyclopedia of Science Fiction). John Clute opines that her strongest speculative fiction writing was at novella length. While I largely agree with that judgment, let me hasten to add that her novels and shorter fiction are definitely worth seeking out. My top recommendations for someone unfamiliar with her speculative fiction would be: The Infinity Box, Welcome Chaos, Somerset Dreams and Other Fictions, Juniper Time, and Margaret and I. Her most famous sf novel, of course, is Where Late the Sweet Birds Sang (which won the Hugo). Last chance to get the Feminist Futures bundle! Sheree Thomas has been invited to Breadloaf!